Tagged under Maki Minami, Gonzo, Anime International Company, Series. All her life, Hikari Hanazono has been consumed by a desire to beat her school rival, Kei Takishima, at anything. He always comes out on top no matter what he does, and Hikari is determined to do whatever it takes to beat this guy... somehow! It's really good I like the characters specially kai . And the story line is good too . But the real problem is the drawing and coordination in the size of characters. U can see huge mistakes in drawing matter . And also the idea of this anime !!! 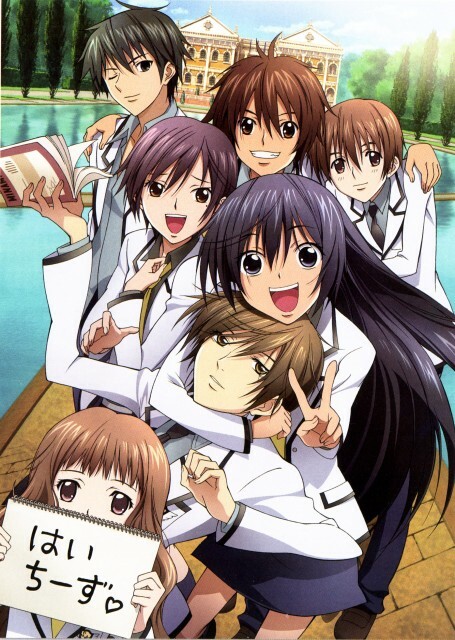 i love this anime very much, it's one of the anime i start watching it in the beginning, although the anime is just normal life of a students but how the events is went was awesome, i liked very much how the story events goes on each character specially Megumi and Yahiro i didn't expect they gonna be a couple (there episode was amazing! ), Kei is an awesome character, and Hikari, well, she's a strong girl but she's so stupid! Can really a person be that stupid?!! and also the drawing is not that much, but still it's a wonderful comedy anime and i really enjoyed it. I'm not a fan of romance but i like high school anime,With a story and comedy for sure..
first of all,this anime has all of them in an unrealistic way!and in a way that makes me feeling Dumb! *Romance:i don't know what kind of idea they'v got about romance,but i know that people aren't that dumb! i mean,like seriously;Hikari didn't know that Kie likes her and he's flirting with her since the first Episode,and it's obvious she likes him,so why long! couldn't they just do it in a better way,or never do it..
*Highschool:i don't get what kind of school that'll give such a "place" to seven students,even if they were the TOP on the nation! this without mentioning their very mini skirts that kills me,and all their School-unrelated activities! *Story:this revolve on what i mentioned just now and they weren't very realistic,but it's obvious they have done all the unreasonable work just to create the story,even though i don't find it;but sometimes an only filler eps are fine..
*Comedy:yeah,it surly had it own comedian times,sometimes it kills me but in most,it's fine and i laugh! Yep,i know..i killed this anime,and lots love it and have another look on it,but what i did say is what i did see..
and after all,it was enjoyable,really enjoyable(i know what i said won't give you this feeling,but i only mention what i disliked or found it weird)otherwise;it's a Fun watching anime in case you'r not watching it with an "open-mind" or anything! A love comedy so classic that more classic you cannot find. The story is very predictable and the characters are fairly flat; the course of the plot is repetitive and boring and there are too many clichès. Even the funny moments don't make you laugh, repeated over and over, always the same scenes. KEI TAKISHIMA: "I'd go anywhere with you, even if our destination was hell." i like the characters very much, they are have a very beautiful friendship, i like the main character Hikari although she is a stupid, and i like Kei character very much, the story is normal but it's a beautiful, and the storyline and the plot is very good and funny, but the only problem is the characters drawing i didn't like it very much but the events of the series is so intersting and funny so u just want to wach it. Its one of the cutest romantic series ever! Its really FUNNY! But in it you sometimes feel the romantic comedy parts that are KAWII! Hikari has always been second to Kei. When they were six years old, their pro-wrestling loving fathers introduced them to each other. Assuming that she was the best in wrestling, young Hikari challenged Kei to a wrestling match only to be thoroughly defeated by him. Ever since that fateful incident, Hikari swore to beat Kei in school grades, sporting events or any competition. To do this, she has enrolled in the same school as Kei since elementary. Now she attends Hakusenkan, an ultra elite school for the wealthy, that costs her carpenter father a lot of money. Hikari and Kei are the top two students in the school, with Kei holding firmly to that number one position. While Hikari considers Kei to be a rival and important friend, she is completely unaware that Kei is in love with her. There are other super cute charecters like Jun and Megumi that are two shy and cute twins rankd 3rd and 4th on the school,Karino and Akira that love each othe but cant confesse ( till the end ;) rankd 5th and 6th and finaly Ryuu ranks 7th and is an animal lover .The twins are unusually close to him because they have been together since childhood. I really love Ryuu ! This anime is so LOL (he is shown in an episode to finish 1000 questions in 10 minutes and get them all correct)! however the plot is interesting but it is not the BEST! I totally love the manga more than the TV series. One of my favourite animes! With high comments I always watch it! I was very impressed after I had watched it! It gives me feelings of joy, fun ...... Watching it you can laugh, cry, smile at the same time. One of the cutest love comedies I've seen so far. (Not that I watch a lot of these) Anyway! I like how dense Hikari was in the entire series. And how innocent she is up until the end. Very nice pairing! Though at times you an just pity Kei. Feel for you dude! great series to watch! Hilarious and gives you the lovey-dovey feeling~! If your looking for a good-looking and smart boys this is the anime for you! It's all about competition for the first spot. Throughout the anime, the characters did nothing but try and beat the other, which also ended up as being Kei always winning and Hikari going onto second place. It was a fixed position from beginning to end. It is a great anime to watch and a must be recommended anime. What I like the most in here is the Special A class concept. Don't have so much to say for this series. It was okay. I don't like Kei and Hikari's story much in here but I do liked Tadashi and Akira's story. The soundtrack was okay too. There are also funny parts. It was enjoyable in a way.